Who doesn’t feel a little weak at the knees when an unexpected bouquet of flowers arrives on the doorstep? I know, on the rare occasions it’s happened to me, I feel decidedly emotional. When those flowers are accompanied by a box of luscious chocolate truffles, my cup runneth over. It may not have been unexpected, but I was still delighted to receive an Aztec Sun bouquet from Serenata Flowers recently as well as a box of salted toffee French dusted truffles. I am extremely fond of roses and lilies and the vivid colours in this bouquet have been brightening up my sitting room during some rather grey and dismal days. I can’t help but smile whenever I look at them. As for the chocolate truffles, they were as good as they sound; dark and rich with a sumptuous texture and flakes of sweet and salty toffee embedded within. I may have sampled rather more than was good for me…. Serenata Flowers offer a whole host of beautiful postal bouquets as well as a varied range of food and drink hampers, chocolates, wines and plants. You can order as late as 10 pm for free next weekday delivery, which seems like an excellent service to me. The salted toffee French dusted truffles are £14.99 for a 250g box and the Aztec Sun bouquet is currently on offer at a remarkable £19.99. Thanks to Serenata Flowers for the flowers and chocolates. There was no requirement to write a positive review and as always all opinions are my own. Serenata Flowers has kindly agreed to give one of my readers a £35 voucher to spend on flowers and/or chocolates of your choice. To be in with a chance of winning, please fill in the Gleam widget below. You will need to leave a comment on this post, answering the question, which then gives you additional chances to enter if you so wish. Gleam will pick a winner at random from the entries received. If you are commenting anonymously, please give me some way of identifying you as I will be verifying the validity of entries. Any automated entries will be disqualified. This giveaway is only open to those with a UK postal address. Winners will need to respond within 7 days of being contacted. Failure to do this may result in another winner being picked. Prizes are offered and provided by Serenata Flowers and Tin and Thyme accepts no responsibility for the acts or defaults of said third party. Tin and Thyme reserves the right to cancel or amend the giveaway and these terms and conditions without notice. I like red roses ! I love freesias as they come in such lovely colours and smell gorgeous! There’s nothing better than a beautiful bouquet of flowers and some delicious chocolates! My absolute favourites are Alstromeria. They are so beautiful. The look so impossibly delicate but more often than not they pack a massive punch in the colour department! And their scent is divine. Small but perfectly formed in every single way. I love them! Oh yes, I’m a fan of Alstromeria too Becki – mini lilies. Roses for no other reason than because I think they are beautiful. Roses, white, they are just stunning. My favourite flowers are daisies as they remind me of being a child and making daisy chains. Thanks for the lovely giveaway. Thank you Jayne, that’s a lovely thought. I remember spending hours making daisy chains. Lilies they are pretty and elegant! I like daffodils as they are colourful and signal the start of spring and the warmer weather! Freesias are my favourite. I love the beautiful colours, so bold and bright for such delicate looking flowers, and the gorgeous fragrance. Oh yes freesias Jane, they do have a wonderful scent. Lilac – the scent always takes me back to when I was little and still living at home. Sunflowers, like having sunshine in the house! Jasmine – it’s a pretty flower with a lovely smell. I even named my daughter after it. Tulips – I love the vibrant colours! Lillies as I love how they look and smell great! I adore stargazer lillies and used to grow big tubs of them – glorious! Unfortunately we were hit by the dreaded lilly beetle and can no longer grow them. I love orchids, they last for ages, look beautiful and take no looking after. At the moment, daisies, there are about a million of them in the garden right now. My favorite flowers are fuschias because I love the colour. I love freesias, they just smell so gorgeous and the colours are nice too. I like orchids – I’ve always liked looking at them since I was small and we went to the garden centre to see Santa(!) but now I’m an adult I still find them incredibly elegant flowers and they’re available in some beautiful colours. i love larkspurs, they are my birth flower of july and are gorgeous! I love having flowers in the house, they add a splash of colour and have such a lovely fragrance. I love Gerberas – I love the colours and how they compliment other flowers. My very favourite flowers are lisianthus. They are beautiful and delicate and seem to look delightful whether on their own or with other flowers. But for scent? Give me pink speckled lilies every time! I like freesias, they are a petty colour and my parents love them so they remind me of them. I love lilies, especially tiger lilies, i think they are beautiful and they bring back memories of tending the garden with my dad when I was a little girl. my fav flowers are carnations because they last for ages and you can get some really modern colours now. My favourite flowers are Freesias as they smell lovely and remind me of when we lived in Guernsey. I love tulips. I love the shape of them, the colours they come in and how impressive it looks when you have a big swathe of them all in full bloom. I really like Calla Lilies as they are an unusual shape and come in beautiful colours! Currently watching the Chelsea Flower Show and the flowers above will fit in spectacularly! Beautiful! Stargazer Lilies because they are stunning, come in beautiful colours and have such an amazing heady scent which fills the room. Orchids are my favourite,they look a bit different to most flowers and I used to always buy my mum a single orchid in a little glass vase when I was little. My favourite flowers are roses, they just smell so nice! I love daffodils, i love how bright and cheery they are. Plus they are a great sign warmer weather is on its way. My absolute favourites are gypsophila (baby’s breath). They’re super cheap to buy and look so dainty and cute, and the last bunch I bought lasted 4 weeks! That’s good going and what a lovely idea, I don’t think I’ve ever bought any on their own. How can you not love sunflowers? The way they look in a field, tall and beautiful. Can’t be beat. I agree Sara, sunflowers are quite magnificent and such a glorious colour too. I can’t choose my favourite, there are just too many that are gorgeous! I love Geberas and Lilys though, also freesia & jasmine for the gorgeous scent. I love stargazer lillies as they give off the most wonderful scent! I love lilies. They come in all different shades, last ages when cut from the garden and placed in the home. Plus the scent is amazing. Sweet Peas. I love the smell, they are easy to grow in the garden and they always remind me of my Great Grandmother because they were her favorite. white or pink roses are beautiful. I love all scented flowers but at this moment I can smell the heady scent of our Lilac tree just love it. I love Hydrangeas, I just love the different colours and the big round blooms, although I have to say all flowers make me smile! Oh, I’m sorry to hear that Becca. Roses remind me of my grandad who hasn’t been around for many years now. I have always liked Daffodils, no specific reason as they smell and look good. I adore sunflowers they are so big and cheer me up they seem to smile. My husband brings me a huge and I mean its mahoosive bunch as they bloom around my birthday. Freesias as the smell of them reminds me of having fun at my grandmas. Lilies – they look and smell beautiful, come in many colours, grow well in the garden and last for ages in a vase. They seem to have a timeless elegance. My favourite flowers are allium. I just love the gorgeous spheres and delicate shades that they come in. My favourite flowers are poppies, I love the bright colours. I love Lobellia, there’s nothing like cycling in the Pembrokeshire countryside, passing various walls with trailing colourful lobellia! Ooh yes Kayleigh, I love lobelia too and this has reminded me that I need to get some for my garden, thai you. Pink roses, my husband wore one on our wedding day. My granddad also used to grow pink roses before he died. They are a special flower in our family! Ah yes Kathleen, my granddad was a rose man too and I always think of him whenever I see one anywhere. Ah yes, it’s a wonderful painting Kat and Van Gogh was a very gifted painter. I love roses, the old fashioned massive ones. They remind me of my grandparents garden when I was tiny. Freesias cause they look so lovely and smell glorious. Pink roses, because they are beautiful! Great reasoning there Karen, there is something very cheerful about snowdrops in the snow. I’m with you on those Alison. Would love to be somewhere I can grow them some day. Ooh yes, nice one Emma. They grow quite well here in Cornwall. Roses. I have lots of roses in my garden & I love the smell of them coming through into my kitchen in the summer. I’d love to get a bouquet for my Dad for Father’s Day. He always buys my Mum carnations so maybe a bouquet that included those! Snapdragons 🙂 My grandparents had them in their garden and I remember being absolutely fascinated by them as a child, now I am an adult and neither of my grandparents are with us they hold all those fond memories – and I am still fascinated by them! I love Violets because they are the name of my little girl. I like carnations – I love the variety of colours and their lovely fragrance. I really like tulips & daffodils because they are both so colourful & make me happy when I look at them! I love Snowdrops in the spring. I just think they look so pretty. Yellow roses because they were my mum’s favourite & remind me of her & her fun for life. My favourite flowers for smelling are lavender, but my favourite to look at are roses. 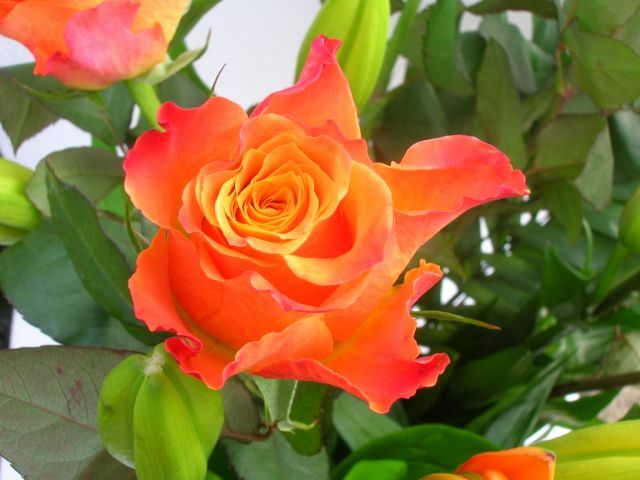 Roses, as they’re a beautiful flower with the most heavenly scent and they come in such a variety of colours. my favourite flowers are peonies i adore every different kind and colour, i love how big and fluffy they are and look so elegant in a vase its a shame they only last a month as they always make me smile. Daffodils – a sign of spring! Cornflowers because they are such a lovely shade of blue and I had them in my wedding bouquet. Ah yes Tracey, hydrangeas dry really well. I have them in the house over winter too. I like tulips the most because they are my girlfriend’s favourite and are guaranteed to put a smile on her face! Freesias are my favourite flowers, mainly because of their gorgeous fragrance, but I love all the colours they come in too. I love sweetpeas because they smell incredible, are easy to grow & maintain, & look really pretty! My favourite flowers are Alstoemerias. They look really expensive and oriental but are actually very cheap and last for ages in water. I am growing some this year as well, can’t wait to see what colour they are. I have some alstromerias growing in a pot at home. I was hoping for a vibrant orange or red, but got pink. Still good to have though. Good luck with yours. Good point Lynn. I remember them being quite common, but I don’t think I’ve seen any in a long time either. I know, I am now determined to try and track some down!!! I adore roses as they are repeat flowering, come in beautiful colours and are extremely fragrant. Sunflowers because they look like they are smiling at the world! Daisies at the moment as my lawn is full of them!! My favourite flowers are white stargazer lilies, I love how they open out from fat buds into huge blooms! I love Freesias, they are a big reminder of me growing up in Guernsey, and have been used as wedding flowers and funeral flowers for my family. I love sweet peas – every year I say I am going to grow some! I like lilies, I think they’re so elegant. I love peonies! Although they don’t really smell, they’re so beautiful and flamboyant! Roses – they were my wedding flower! Roses – they were my wedding flower. Such happy memories every time I see one. My favourites are tulips, but it’s a shame that they don’t last long. I love white roses every since i read snow white as a girl. Yellow Roses – I just love them – they cheer me up no end! Freesia because their scent is wonderful and reminds me of weddings. I love daffodils – I find the shape of them really intriguing, and they’re so bright and colourful. It helps that they’re the flower of Wales too so I get to see plenty of them! It’s not about me, i’m entering to win for my girlfriend Sarah. She likes roses. Shhh – #DontTellSarah. « Previous post link Cornish Cauliflowers are Go! The Cool Cauliflower Recipe Collection.